We're thrilled to announce a new piece of art has joined the New Orleans City Park family. Jendiva, a welded steel sculpture by Michael Dunbar, was installed at the Park today. It is located on Roosevelt Mall near the front of Tad Gormley Stadium. Jendiva is a gift from Michael and Susie McLoughlin. NEW ORLEANS, LA- Veterans and active duty members of America’s Armed Services travel great distances and make great sacrifices to preserve and protect freedom and liberty, the scaled replica of the Vietnam Wall is just one way we can remember the sacrifices of those that gave all during the Vietnam War. 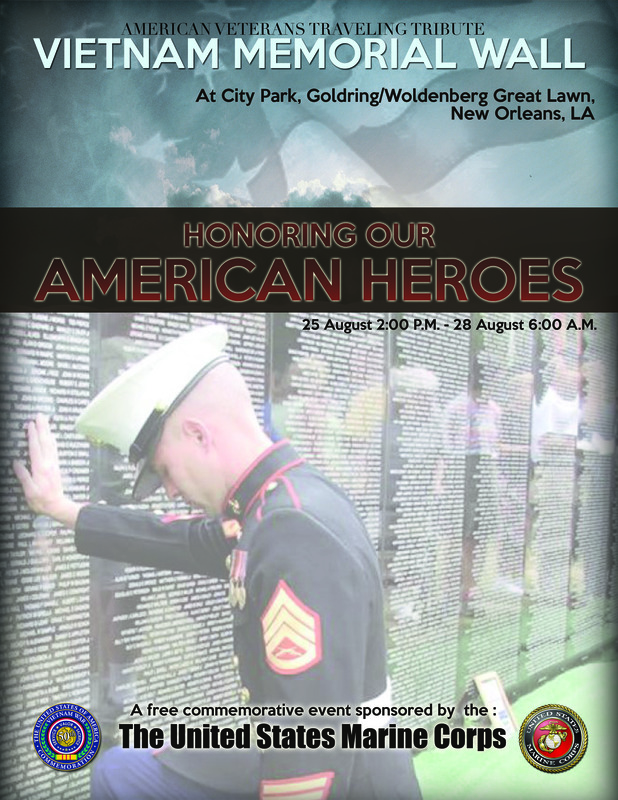 The United States Marine Corps invites you visit the wall when it visits New Orleans in City Park from August 25-28, 2016. The event opens at 2pm on Thursday, August 25th and is open 24/7 through Sunday, August 28th at 6am. A Wreath Laying and Commemoration Ceremony to honor Vietnam Veterans is scheduled for Saturday, August 27th at 10am in City Park on the Goldring/Woldenberg Great Lawn next to the Wall. The United States Marine Corps brings this wall to you as a part of its Commemorative Plan to honor and remember the 50th anniversary of the Vietnam War. The United States Marine Corps is a Commemorative Partner of the Office of the Secretary of Defense’s Vietnam Commemoration Office. One of the objectives of this office is to thank and honor veterans of the Vietnam War, including personnel who were held as prisoners of war (POW), or listed as missing in action (MIA), for their service and sacrifice on behalf of the United States and to thank and honor the families of these Veterans. The wall is an 80 percent scale version of the Vietnam Wall in Washington, D.C. Across its 360-foot length the wall contains every single name etched on the original. At its apex, the memorial is an impressive eight feet tall.